Default map type - Select the default map type to use to display maps, from Google (roadmap), Google (satellite), Google (hybrid), or OpenStreetMap. This setting is available only when Google Maps is selected as the map provider. 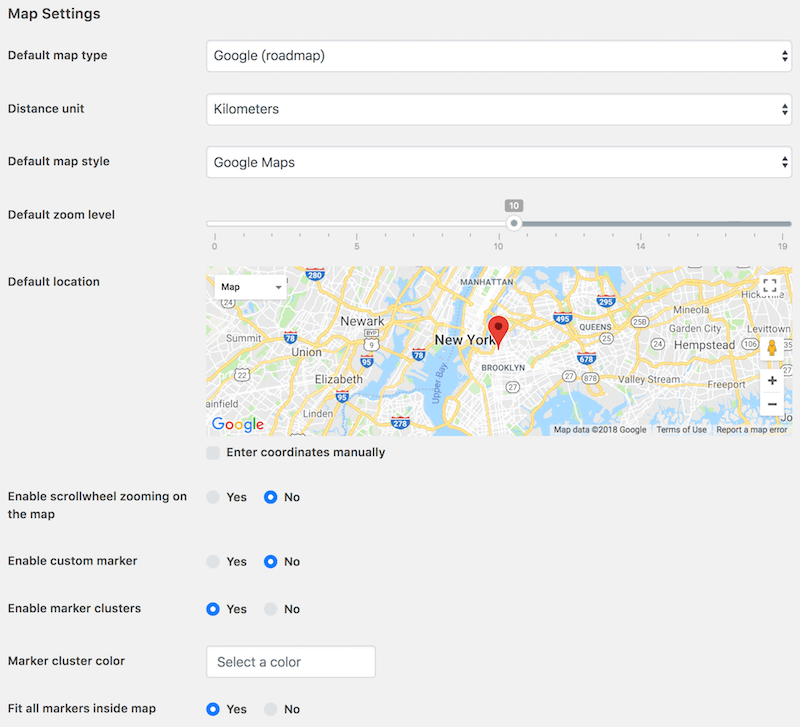 Default map style - Select a custom Google Maps style to be applied by default. Distance unit - Select Kilometers or Miles. Default zoom level - Specify the default zoom level of the map. Default location - Specify the default location displayed on the map. Click Enter coordinates manually to manually enter latitude and longitude coordinates. Enable scrollwheel zooming on map - Whether or not to enable zooming in/out on the map using the scrollwheel of the mouse. Enable custom markers - Whether or not to show custom styled map markers. Custom marker color - Select the color of custom map markers. Custom marker icon - Select the icon shown on custom map markers. Custom marker icon color - Select the color of icon shown on custom map markers. Enable marker clusters - Whether or not to cluster map markers and show the number of items in each cluster. Marker cluster color - Select the color of marker clusters. Fit all markers inside map - Whether or not to automatically zoom in/out the map so that all map markers fit inside the current viewport of the map.